Steering/Turning Radius: Electronic Power Steering (EPS)/18"
Deck Cutting Height: 1.5" - 4"
Tires (Front/Rear): 16" x 6.5" ball bearings/23" x 10.5"
Engine Oil Capacity: 1.9 qt. Disclaimer: †Limited Warranty - 5- Year Chassis And Front Axle, Unlimited Hours. 3- Year And 4-Year Powertrain (Engine And Transmission) Unlimited Hours. Normal Wear Parts 30 Days. 16 in. x 6.5 in. ball bearings/23 in. x 10.5 in. 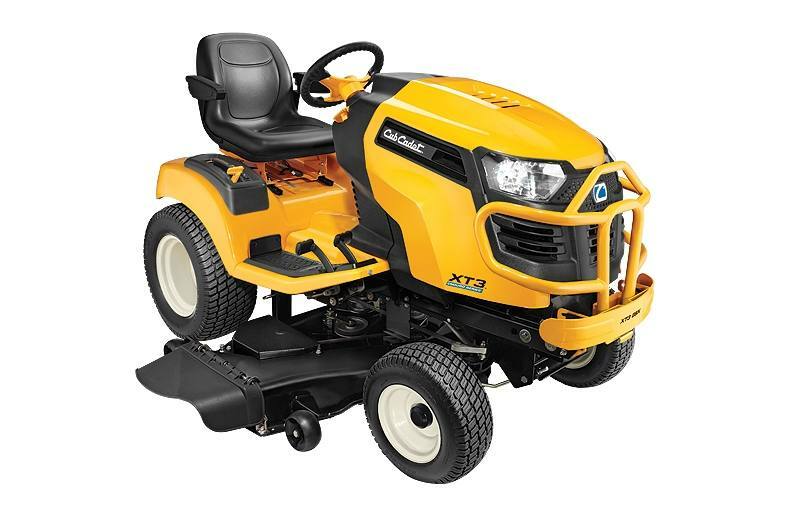 2019 Cub Cadet XT1 GT50"
2019 Cub Cadet XT1 GT54"
2019 Cub Cadet XT1 LT42"
2019 Cub Cadet XT1 LT46"
2019 Cub Cadet XT1 LT50"
2019 Cub Cadet XT1 ST54"
2019 Cub Cadet XT2 GX50"
2019 Cub Cadet XT2 LX42"
2019 Cub Cadet XT2 LX46"
2019 Cub Cadet XT2 SLX50"
2019 Cub Cadet XT2 SLX54"